Lindbergh LaVista Corridor Coalition Inc. has received the 2012 All Star Award from Constant Contact®, Inc., the trusted marketing advisor to more than half a million small organizations worldwide. Each year, Constant Contact bestows the All Star Award to a select group of businesses and nonprofits who are successfully leveraging online marketing tools to engage their customer base, and drive success for their organization. LLCC’s results ranked among the top 10% of Constant Contact’s international customer base. We are happy to be recognized by Constant Contact for achieving strong marketing results and connecting with our community. Constant Contact’s tools have helped us in the following specific ways to better manage constituent relationships and engagement. Car Clash: Europe vs. the U.S.
Europeans are working hard to discourage drivers, cars and parking in their cities. Why is American city planning different? Can they be retrofitted into attractive, transit boulevards lined with trees, sidewalks and affordable housing and anchored by mixed-use centers with a public life to be proud of? June Williamson and I are tracking over 35 North American corridors that are being redesigned not to make driving miserable, but to recognize the multiple social, environmental, economic and transportation purposes that great streets serve. Their integration was highlighted in the grassroots-led temporary re-striping of Ross Avenue as “Ross Ramblas” in Dallas this week at Build a Better Boulevard. Participants employed several techniques of Tactical Urbanism, including pop-up shops, chairbombing and dumpster pools. Every U.S. city once had street cars. Will Americans ever again support public investment in mass transit? More typical is the ongoing 10-year revitalization of a five-mile stretch of Columbia Pike in Arlington County, Va. It exemplifies the intelligent use of tight form-based codes to grow from one-story strip buildings in parking lots to mid-rise mixed-use buildings fronting tree-lined sidewalks at nodes on major intersections. The site-specific code quickly tapers heights where the new development faces the existing neighborhoods and new bike lanes on the less busy streets. This strategy retains the existing affordable housing in between the nodes while the tax revenue from the new density goes toward supporting a streetcar. Cambie Corridor in Vancouver is employing similar techniques but has upped the ante with some stunning modern mixed-use buildings and a highly efficient district energy system that balances out daytime commercial energy demands with the residential night-time peak loads. Aiding these efforts is the new street design manual for walkable urban thoroughfares. It is the first officially recommended practice that does not refer to sidewalks as “vehicle recovery zones”! El Paso recently adopted the manual to connect its implementation of Bus Rapid Transit with redevelopment of outdated properties along five major corridors. Imagine if all 50 DOTs followed suit and revised their Level of Service Standards accordingly! We might see more transformations of urban highways to boulevards and Complete Streets. Funding remains an obstacle and demand for Sustainable Communities Partnership federal planning grants far outstrips supply. 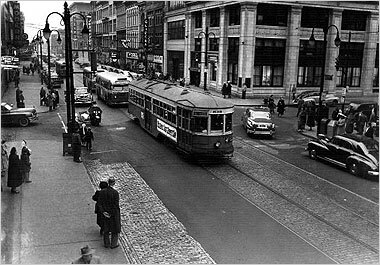 Can private real estate developers fund streetcars as they did early in the 20th century? Can the public again support public sector investments in infrastructure, as it did mid-century? How else can we provide an alternative to our broken system of “drive till you qualify” affordable housing, accommodate changing demographics and markets and make our least sustainable landscapes into places worth caring more about? In 1974, Yae Nakato left her native Japan to help run a family startup in Atlanta. Her sister, the late Tetsuko Nakato, had opened the Nakato Japanese Restaurant and needed her younger sister’s assistance. Today, there are a total of five Nakato restaurants with two in Charlotte, and one each in Myrtle Beach, S.C., and Springfield, Mo. All offer a hibachi grill as well as traditional Japanese dishes, some of which reflect Mrs. Nakato’s worldly culinary influences that she perfected at the first location at 1776 Cheshire Bridge Road. Yae Nakato of Marietta had contracted fluid in her lungs and died Saturday from its complications at Piedmont Hospital. She was 96. The funeral will be held at 2 p.m. Friday at the Happy Science Temple in Atlanta. H.M. Patterson & Son, Spring Hill Chapel, is in charge of arrangements. Mrs. Nakato was the youngest of seven siblings, children of parents who owned a lumber company that was based in Manchuria, China, and conducted business throughout Asia. After World War II, her parents lost the business and were forced to return to Japan, their homeland. In her younger years, Mrs. Nakato immersed herself in track and field sports and participated as a sprinter in Korean national events. Coaches and teammates nicknamed her “Tsubame,” which means sparrow in Japanese. Mrs. Nakato and Takao Nakato, her late husband of more than 30 years, never had any children but helped raise several. She never learned to speak English. Additional survivors include nieces and nephews. We are excited to introduce to you the nominees for the Board of Directors Class of 2012. With your approval at our Annual Meeting on 11 November, these talented individuals will join the Class of 2011 (Henry Batten, Amanda Leech, Curry Roberts, Yuki Takahara) in leading LLCC in the coming year. A vice president in the Atlanta office of Edelman, the world’s largest public relations firm, Courtney develops and manages execution of comprehensive public engagement and marketing communications programs for large corporate clients, including ongoing corporate brand work and new product launches, and oversees the day-to-day operations of Edelman Southeast’s technology practice group. Courtney’s experience includes strategic execution of public relations initiatives, direct consumer and business-to-business marketing, sales support and proposal development efforts, trade show and event management, and corporate internal and external communications. Prior to joining Edelman in 2007, Courtney managed the Impact Marketing program for financial institution clients at CheckFree Corporation. (now Fiserv), where she was responsible for developing and executing consumer direct marketing campaigns. Previously, Courtney served as marketing communications manager with NCR Corporation. and account executive on the BellSouth International account at Ketchum. She began her career as a press coordinator in the office of Georgia Governor Zell Miller. Fluent in Spanish, Courtney holds both a B.S. in International Affairs and an M.B.A. from the Georgia Institute of Technology. She lives in Morningside with her husband and two children. Harriet is the Senior Business Development Manager for Public Broadcasting Atlanta, the local affiliate of National Public Radio and PBS, whose studios are in the immediate area, just off Cheshire Bridge Road. Her previous experience has included teaching and research at the Department of Business Studies at the University of Edinburgh, legal practice in the Bahamas, positions with Shell Oil in HR and Finance, with Arthur Andersen in Market Research and international service on three continents with the YMCA. Her Swim School on Grand Bahama continues its work today. She is the Past President of the British American Chamber of Commerce and serves on the Board of the Georgia Friends of the University of Edinburgh, when she earned her degree in Law. Her hobbies include various sports, the performing arts,and her 1938 MG.
Harriet has served two previous terms on our Board of Directors, coordinating our Pedestrian Concerns Committee. She lives in the Lindridge Martin Manor neighborhood. Dorean is Vice President & Branch Manager for Regions Bank – Cheshire Bridge Road Branch. She and her staff have been very active in the community for the last several years, participating as a sponsor in the Taste & Tour of Cheshire Bridge, and leading a Financial Literacy Program for the parents of children at the Easter Seals Early Learning Center on Sheridan Road. She and her husband live in Fairburn. For the last eight years, Jason Stephenson has been on the staff of Westminster Church located in LaVista Park. He works with the church’s middle and high school students as Director of Youth Ministries, after previously serving as the Executive Director of Camp Westminster in Conyers. Jason graduated from Belhaven College in Jackson, MS with a degree in Business Administration, spent his childhood in East Tennessee and Mississippi, and remains very close to his four siblings. He’s a huge sports fan, enjoys teaching and outdoor activities. Jason has served as Treasurer for LLCC for the past two years. Rosalie Townsend works for Children’s Healthcare of Atlanta on the Scottish Rite campus as a pediatric rehabilitation nurse. She is currently coordinating the Hispanic ESL classes that will begin in January 2011, and is excited to have the opportunity to volunteer and help the LLCC community reach its full potential. Rosalie and her family live in Tucker, and have been members of Westminster Presbyterian Church for many years. Behringer Harvard bought Buckhead apartment community The Reserve at LaVista Walk from Atlantic Realty Partners. The Dallas-based company did not report financial terms. The 283-unit, 4.4-acre development was finished in 2008 and is two miles southeast of Lenox Square Mall.